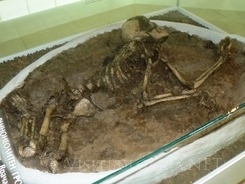 A remarkable archaeological discovery was made in the northwestern part of Bulgaria. One of the oldest temples of the Sun was found in the village Ohoden, close to Vratsa town. The studies carried out by archaeologist Georgi Ganetsovski reveal that the temple is 3000 years older than Stonehenge prehistoric monument. The sanctuary was used to determine the position of the Sun which makes it one of the earliest observatories. The inhabitants of the ancient village used the temple to calculate the best time for harvest. In a close proximity to the monument had been discovered the skeletons of a man and a woman dated to around 8000 years ago. The site gained international interest and the archaeological team was introduced to a forum in Romania where specialists from all over the world could meet and share experience.